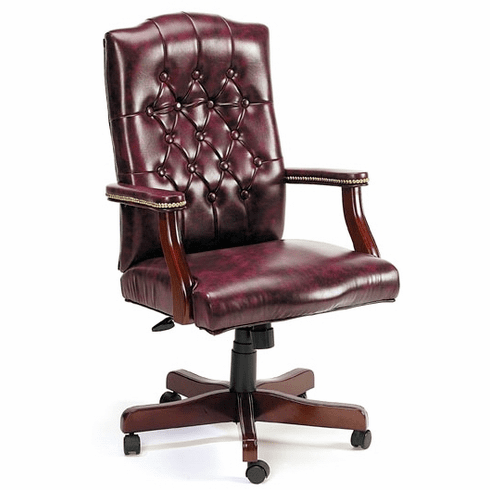 A stately Martha Washington style chair that features classic traditional button tufted back, pneumatic seat height adjustment, tilt with tilt tension adjustment, hand applied brass armrest tacks, padded mahogany or cherry finish arms and a beautiful 5 star mahogany or cherry finish base with dual wheel casters. (The vinyl chair is pictured on the left. The leather chair is pictured on the right). Dimensions: Seat Size: 21"W x 18"D. Back Size: 21"W x 26"H. Seat height adjustment: 18" - 22"H. Fully warranted by Boss Office Products. This chair normally ships within 2-3 business days from our GA or CA warehouse.